The current uncertainties of the British gun trade should be obvious. From John Dickson & Son in Edinburgh and Anderson Wheeler in London closing their retail premises, to reduced orders almost everywhere, these are not the best of times for “best” guns. Yet there certainly are bright spots, and optimism remains. An example is James “Longthorne” Stewart, an engineer from Lancashire with a background in toolmaking, who recently threw a spanner in the works with shotgun barrels machined from single billets of steel. Stewart is so confident in his idea that he has launched a gunmaking company around it. James and Elaine Stewart—Longthorne Gunmakers—have wed traditional craft design and new engineering technology to create a vivid post-modern product with a unique character. The Stewarts’ success, which will hinge on a union of Boss-style side studs and racing-car technology, is a romance worth telling. When the machining is complete, all polishing is done in-house, with smaller internal parts such as pins and screws polished mechanically while larger parts such as actions and barrels polished by hand. Finishing and fitting is done in house by hand as well. Engraving is executed mechanically and finished by hand, while gold inlay is the exclusive province of handwork. All wood is Turkish, with stocking and checkering done in-house. A machine is used to remove the bulk of the wood, with the final gunfitting done with the client present. Longthorne currently employs nine people but is hunting for more apprentices and qualified engineers. The firm uses no outworkers and does not import either finished or semi-finished components. Clearly Longthorne is not powered by the same engines as traditional British gunmakers. By creating the tubes, ribs, lumps and chokes out of a single 60-pound block of high-quality steel, the barrels are trim and light. Because there is no soldered rib, some steel can be redistributed on the barrel-wall thickness and still keep the weight down and the strength up. The barrels are unbelievably strong—so strong that you can drive a Range Rover over a set bridging two blocks of wood and they won’t bend. At just 2.291″ from the bottom of the action to where the standing breech meets the quarter-rib, the Longthorne 12-gauge over/under is the trimmest of guns. The action is also machined from one block of solid steel and can be made to suit a right- or left-handed shooter. The strap and triggerplate are integral, adding further to the gun’s strength. The standard weight for all of the sidelock range with 30-inch barrels is 7 pounds to 7 pounds 6 ounces, depending, according to Elaine, on “many variables”: “The lightest 30-inch-barreled 12-bore we have done is 6 pounds 6 ounces—without a rib, much lighter. We are also able to make the barrel walls thinner if necessary.” So far Longthorne has built about 200 of its solid-barrel guns since the company’s inception, in 2010, but Elaine says the firm is “aiming for 100 to 150” in 2018. While Longthorne guns are engineered, they are not manufactured—stamped out cookie-cutter style. Longthorne goes back to 2006, when founder James Anthony Longthorne Stewart began designing guns, having previously made small internal firearms components in Australia. The engineer’s ideas didn’t gain traction until his finished guns finally were rolled out in 2010 at the Country Landowners Association Game Fair at Ragley Hall. Following that launch, Longthorne was commissioned to make four guns celebrating the heritage of Belvoir Castle in Leicestershire for the Duchess of Rutland. 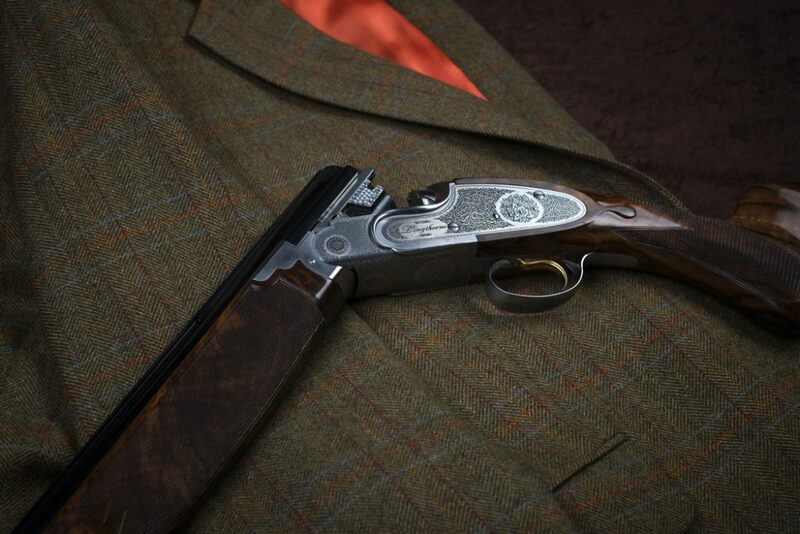 Known as The Rutland Range, the guns now form part of Longthorne’s premium offerings of bespoke guns. Only sidelock over/unders currently are available, but a boxlock over/under and a sidelock side-by-side are in the offing. The firm’s website describes the 12-bore side-by-side as “well into production,” and it will be available with 28- to 32-inch steel-proofed barrels, 3″ chambers and a surprisingly light weight of 6½ pounds with the longest barrels. The price for the deluxe engraved model will be around £23,500 (including 20% VAT, if applicable). All current models are identical internally, with prices increasing with more intricate embellishment. The Hesketh (£15,200) is minimally engraved with a border and a skosh of scroll, though it can be made with a blackened action and contrasting inlaid gold. The Rose & Scroll (£17,251) features traditional English bouquet & small scroll. The Hesketh Deluxe (£19,970) is adorned with a deep bold acanthus pattern. The Celtic (£23,929) can incorporate thistle, dragon, shamrock or other zoomorphic elements. The Rutland (from £28,090) is designed around the heritage of Belvoir Castle and features an embossed peacock (the symbol of the castle) and the ducal coronet and coat of arms. Beyond its standard engraving patterns, Longthorne is working on an art-nouveau design intended to eventually replace The Rutland. But as with most British guns, anything is possible at a price. 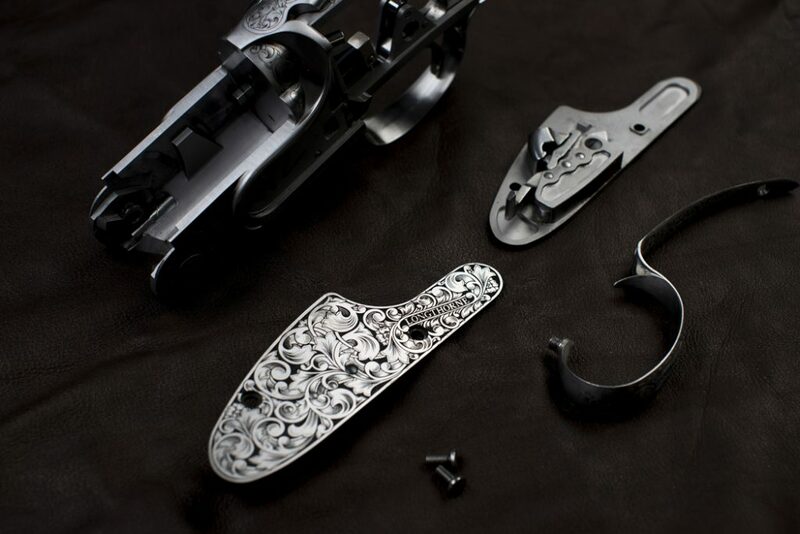 Many of the Longthorne guns built so far have been delivered with personalized engraving elements. The Stewarts’ daughter, Chloe, is responsible for all of the engraving designs except The Hesketh, which was created by one of England’s most renowned engravers who prefers to remain anonymous. The Stewarts recently have engaged an artist to create entirely original designs. 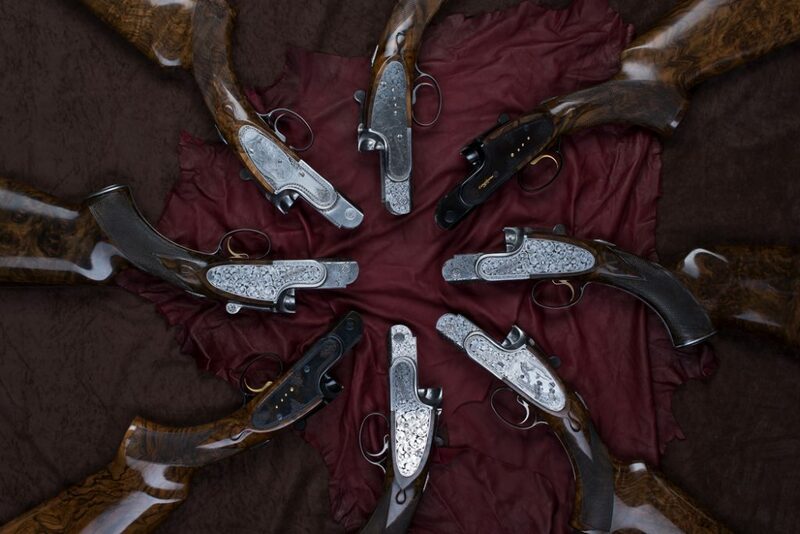 Prestigious clients have included the late Duke of Westminster, the Earl of Leicester and a member of a Middle Eastern royal family who owns six Longthorne guns with 12 sets of barrels. James Stewart is never happier than when creating guns for shooters. An enthusiastic game and clays shot, he is also a Clay Pigeon Shooting Association Level 1 instructor and a member of The Institute of Clay Shooting Instructors. Stewart has divided the traditional British gun trade. Some dismiss him as an upstart indifferent to traditional barrelmaking values; others admire him for his innovations pointing back to the great engineer Sir Joseph Whitworth. And while Longthorne guns are engineered, they are not manufactured—stamped out cookie-cutter style. They are assembled one at a time. Stewart’s efforts remind us that working in an established field can be both restricting and empowering and that building guns with little regard to cost is a risky business. There has been a certain amount of belt-tightening in the gun trade in recent years, with some firms declining to buckle down and invest in machinery and/or apprentices. With London fine guns struggling to punch their weight, it may be that James Stewart’s unorthodox approach to barrelmaking is exactly what the trade needs. Yet the Longthorne story is still unfolding. While the firm’s revolutionary barrels have found a market in the UK, they have yet to undergo the test of a US launch. That said, knowing Americans’ taste for innovation, I have a feeling the reception will be a warm one. For more information, contact Longthorne Gunmakers, Ltd., 01144-1772-811215. Beautiful gun. Would love to own and shoot it but feel it is out of my price range. There comes a time in a man’s life when he must say “hang the price, it is time for a custom shotgun”. This realization grows over time, and may occur after your son’s marriage, or the birth of a grandchild, or even your first heart attack. Life is too short to shoot a substandard gun. Belly up to the bar, bite the bullet, and order a Longthorne SxS. You will find the funds some where. Just do it.